I am finishing the Computational and Statistical Learning PhD program at Carnegie Mellon University. My primary work is in causality discovery from observational data with Richard Scheines, Clark Glymour and Peter Spirtes. Currently, I am moving to London for a couple of years as a post-doc. THIS HOMEPAGE IS OUT-OF-DATE. The current one is at Gatsby. Silva, R. and Scheines, R. (2005). New d-separation identification results for learning continuous latent variable models. Proceedings of the International Conference in Machine Learning, ICML 05. Tech report version. 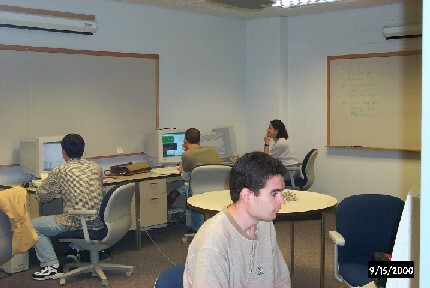 Silva, R.; Zhang, J. and Shanahan, J. G. (2005). Probabilistic workflow mining. Proceedings of Knowledge Discovery and Data Mining, KDD 05. Tech report version. Silva, R.; Scheines, R.; Glymour, C. and Spirtes P. (2003) "Learning measurement models for unobserved variables". Proceedings of the 19th Conference on Uncertainty on Artificial Intelligence. Moody, J.; Silva, R.; Vanderwaart, J. and Glymour, C. (2001). "Data filtering for automatic classification of rocks from reflectance spectra". Proceedings of the 7th ACM SIGKDD Conference on Knowledge Discovery and Data Mining, p. 347-352. ACM Press, San Francisco, CA.